A traditional earth-oven lunch is a food-lover’s paradise. Cooked in underground by hot stones; chicken, fava beans, plantains, and native potatoes have never tasted so good! We can accommodate most dietary restrictions. Please note any restrictions in the special requests field at time of booking. 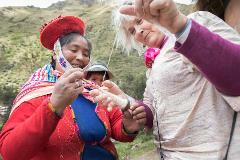 Through our authentic and impactful community visits, Awamaki hopes to educate the responsible traveler about the Pre-Incan weaving tradition and Andean indigenous culture, and allow you to connect directly to women in the remote mountains of Peru. The trip begins in Ollantaytambo, where we meet our transportation in the Plaza de Armas in front of La Esquina café. Expect a beautiful drive as we ascend nearly 1,000m from Ollanta to the upper Andean community of Patacancha or Huilloc. The gravel road is bordered by Inca terracing, waterfalls, and traditional farm plots that are still used today. 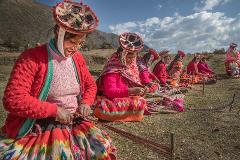 The communities that we pass on our journey up the mountain are known for their traditional lifestyle, dress, and weaving. Upon arrival we will visit the cooperative's weaving center. During your visit to the weaving center you will learn about weaving and its significance in Andean culture, and see a demonstration of the entire process; transforming alpaca or sheep wool from its raw state into a beautiful, vibrant textile. It is fascinating to see this ancient artform come to life in its original environment. After the demonstration, you will get the chance to try weaving for yourself. One of the weavers from our women's cooperative will act as your personal teacher to help you create your own bracelet which you can take home as a memento of your time in the community. Your delicious earth-oven lunch will be ready to enjoy straight after the weaving lesson. 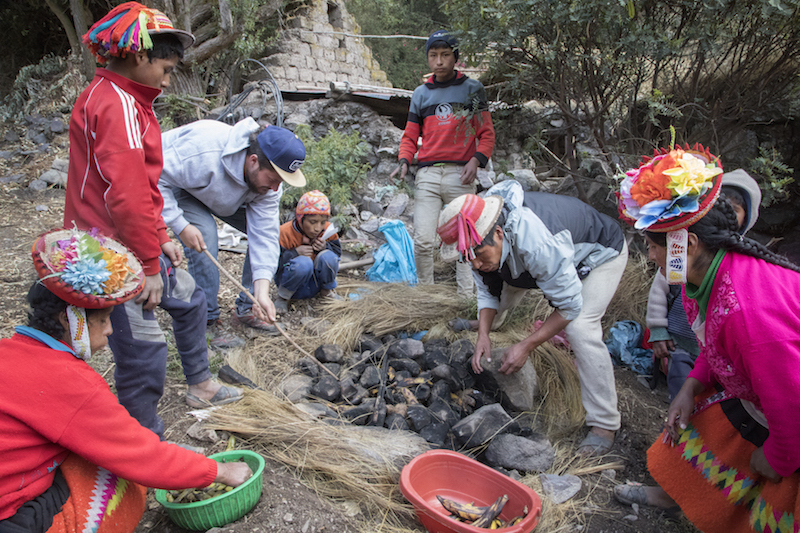 The earth-oven style of cooking is locally referred to as Pachamanca and is a tradition that dates back to pre-Incan times. The food is cooked by hot rocks underground and then enjoyed along with our weavers in their weaving center. A gastronomical delight not to be missed! At the end of the tour, you will have the chance to buy textiles directly from the women who make them. The weavers sell a wide range of high-quality artisan good that we guarantee are hand woven, naturally dyed, and 100% alpaca or sheep's wool. Please Note: Because we are a small non-profit, we are not able to guarantee a private tour. There may be other visitors in your tour group. However, most of our tours are very small, between 2 and 6 people. We can accommodate most special requests. We can accommodate nearly all dietary restrictions. Please note special requests or dietary restrictions in the “special instructions” section when you book. We will contact you if we are unable to accommodate your request. 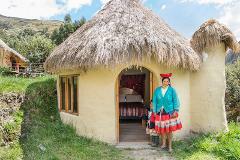 Other travel needs: If you need transportation from Cusco to Ollantatyambo, your hotel will be able to arrange this. You can also find instructions here for using a shared taxi or buses. We are unable to arrange transportation from Cusco to Ollantaytambo. However, we can help you arrange transportation from Ollantaytambo back to Cusco. Just ask your guide during your tour. We can also bring your luggage on the tour if you are in transit, or store them securely at our office. We are usually able to accommodate late departures at 11am for a $20 fee. You can select this option as part of the booking process. If you are traveling alone and would like to book a tour, book for two people and then at check-out use discount code: SoloTravelerDT for 23% off.